The Park Avenue entrance gates to Blackheath’s Memorial Park were funded by public subscription. They were officially opened on May 18 1938, by Minister for Works and Local Government Mr Eric Spooner. The project commemorated the reign of King George V (1910-1936). 300 people turned up for the occasion in misty autumn rain. 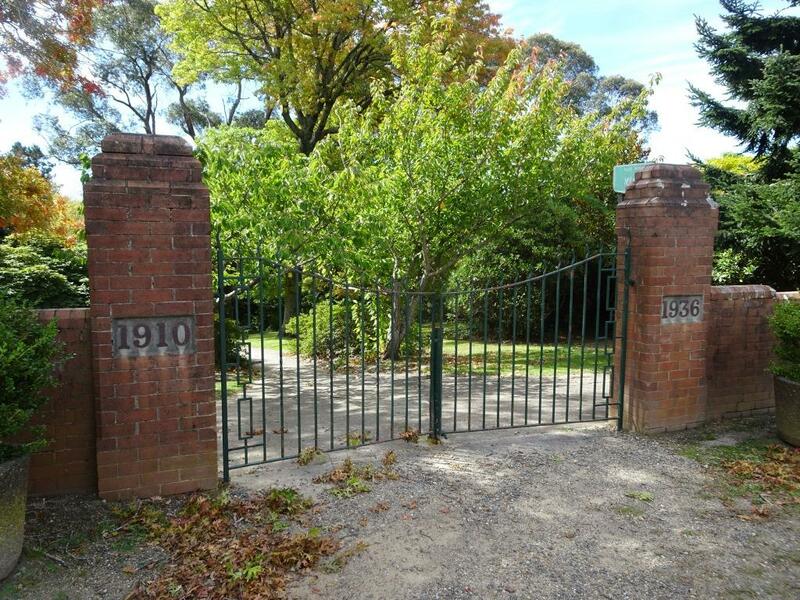 Now the 1930s was not the most exciting architectural era and the gates are definitely ‘of their time’. I suspect few people would be aware of what the dates on the brick pillars signify, ie; George V’s reign. 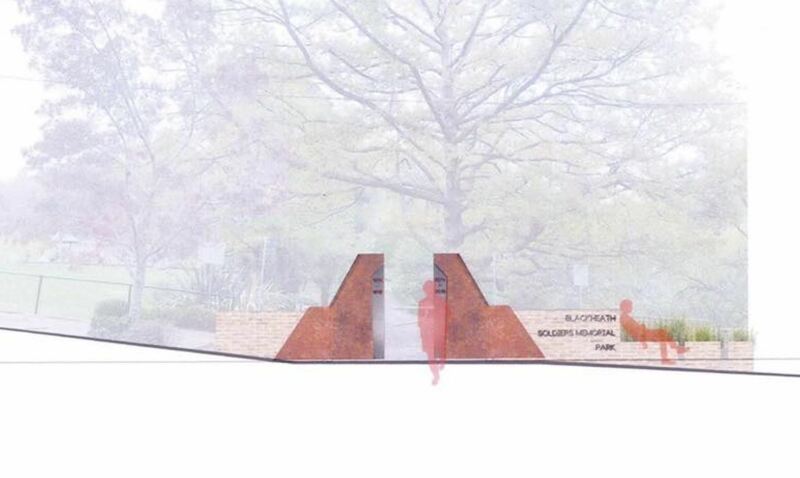 Mrs Hague-Smith suggested that instead of erecting memorial gates for the proposed King George Memorial, that Council consider the provision of a municipal-owned gymnasium. Aldermen were of the opinion that subscriptions were given for a specific purpose. The gymnasium should be a separate matter. The request was not granted. There is no record of any displeasure over the design itself. These days, most visitors enter the park from Prince Edward Street, opposite the caravan park and beside the duck pond. It was decided that another set of gates should be built here, honouring those who served in WWI, and in whose memory the park was created. Initially a brick wall was put up. I presumed the new gates would be similar to the those on Park Avenue, hopefully with a little more flair. But no, within days a new feature was added. Oh my hat! Someone (OK, it was me) posted a photo on the Blue Mountains community Facebook page asking what everyone thought. Now I did put up a header saying ‘I’m not sure whether this is how they will turn out‘, but social media being what it is, people leapt in, boots and all. Darth Vader, brutalist, Mad Max, Batman, insensitive, uninviting, prison gates, WWI tank, graffiti magnet, etc etc etc…. A spokesperson from the Blackheath Area Community Alliance responded. Apparently 14 community groups approved the design. It was pointed out that Coreten steel is meant to rust over time, and thus ‘soften’ the look. 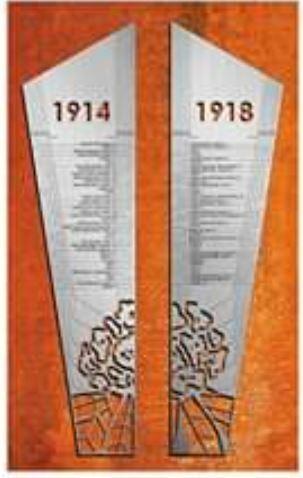 Two stainless steel panels are to be added, containing the names of the 77 Blackheath residents who served in WWI. Artist’s impression of stainless steel panels against rusted Coreten. 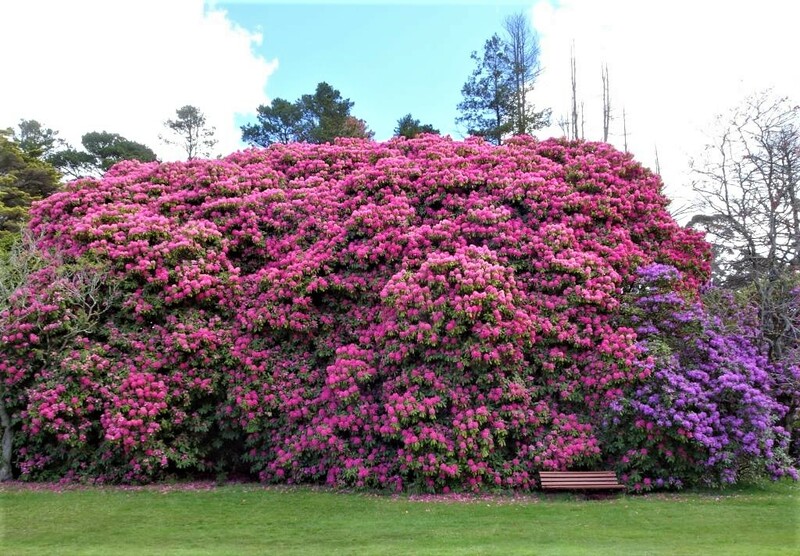 A laser cut image of a rhododendron will represent the chief glory of the park, those magnificent trees purchased by local residents in 1923. 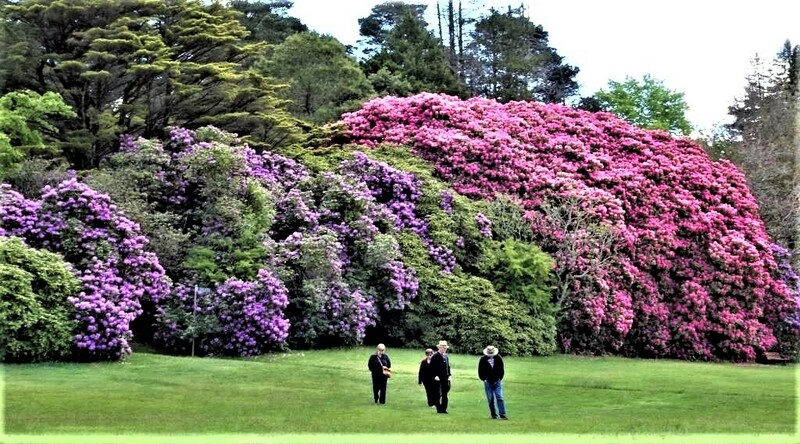 A rhododendron for each serviceman was planted in a Remembrance Walk, which has matured over the decades into something very special. Well, the jury is still out. Many of us, myself included, have a lot of emotion invested in Memorial Park. We are just waiting and hoping for a good outcome, especially as labour and materials for the project were donated by individuals and local businesses. The only artist’s impression of the overall design I have seen gives no real idea of the end result. How interesting. I find it amazing that a simple thing like a pair of gates, well… there’s always a story. Thanks for sharing this one. I hope the gates are all the community wish them to be. At least in a hundred years time there’ll be another interesting story about a caring community to tell whether they’re a win or a fail. Probably become a tourist attraction in their own right, Evie. Just hope people don’t deface the damn things. Oh, dear! Reminds me of something they built here at the entrance of our city–on all four corners. Only these were huge stone slabs standing upright with a few non-flowering plants. I thought they must be something to do with the Jolly Green Giant’s graveyard or something. This is the entrance to the city closest to the airport, so many people would see them. A child could have designed something more interesting than this. Some so-called artist made thousands of dollars just to “design” it. This modernism can be taken too far. In my opinion (which no one ever asks for) there is no artistic design at all in your park gates or our city entrance. Evie talks about 100 years from now. It makes you wonder what they will think of the people who put these things in place. Well, I think I’d be happier with stone than our ghastly steel ‘prison gates’, Diane. I think the problem is that projects are approved on ‘artist’s impressions’ that look nothing like the real thing. As one who lives opposite the Park Avenue Gates we are well aware that 1910 was the year that the Blackheath Golf Club was incorporated at the Memorial Park as a 9 hole golf course. 1936 was the year that the park was established as the Soldiers Memorial Park to commemorate the 71 (?) diggers from Blackheath who served in WW1. When complete I think those gates will be fine at the Duck Pond entrance. Thanks for your comment Rob. I should point out that the dates 1910-1936 on the top gates are not really anything to do with the Park or the earlier golf course. They commemorate the years of King George V’s reign. The park was established in 1923 to honour the 77 men who served in WW1. Thanks very much Pauline, glad to have that news. Town historian Geoff Bate and I pondered this for ages and this is what we came up with. I’ll let Geoff know when next I bump into him.